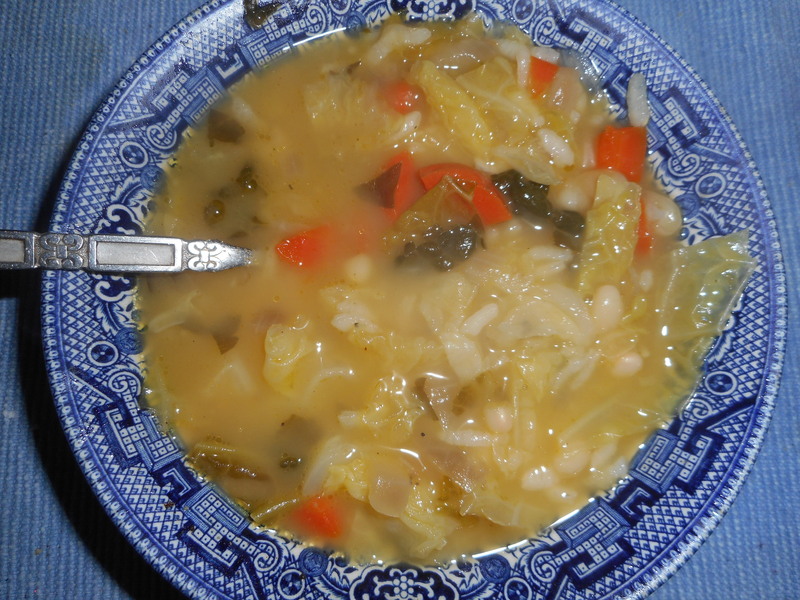 Yet more snow, high winds, and frigid cold….perfect soup weather. Yeap, I have another soup to share: rib sticking winter fare – on my menu today. I’ve been making this recipe for a long time; it is a favorite for me. This Italian Peasant soup hits the spot. It is full of flavor but is fairly cheap to make: doesn’t have any meat or pricey ingredients. If you use vegetable broth your soup can be vegetarian. It isn’t tricky either to throw together and it is naturally gluten free. Do make sure your broth is safe; most of the brands out there are not suitable for use by anyone with celiac; they somehow seem to have some small measure of gluten in it rendering the soup uneatable for those of us with celiac disease. I strongly suggest that you make your own beans from dried ones; much more flavor than canned already cooked beans, cheaper and really not much trouble. 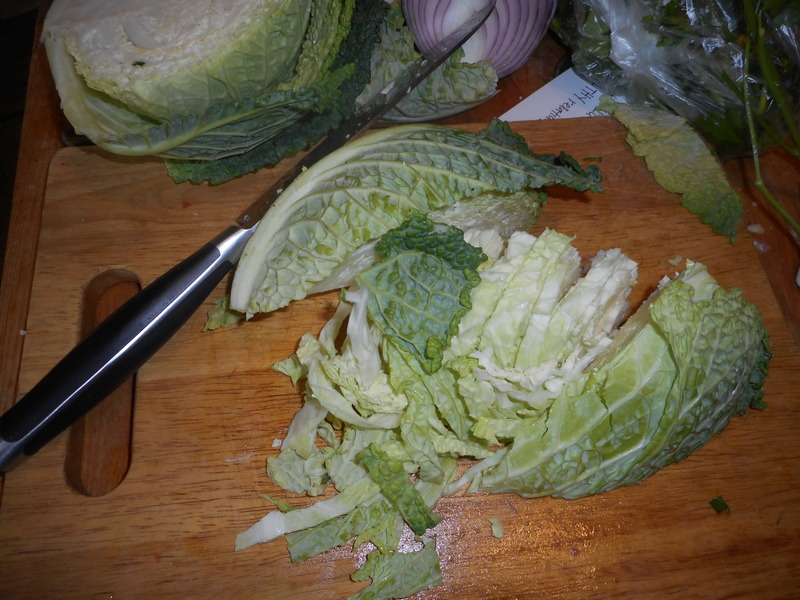 Savoy cabbage, located right next to the usual green cabbage: it is a bit pricey than regular cabbage but the green crinkly leaves are a big part of the flavor appeal of this soup so get a small head for this recipe if at all possible. Oh and, you really need the Arborio rice as it won’t be right with regular rice; Arborio rice soaks up liquid and is creamy with a different texture than long grain rice. This recipe makes a lot of soup and is great leftover for lunch. Soak 1 cup dried white beans in water to cover; I use the quick method; bring to boil, boil 2 minutes, let stand 60 minutes. Rinse really well and clean the pot too. Then return the beans to the washed pot and cover with fresh filtered water. Cook beans with the bay leaf for 1-2 hours until tender but not mushy. Puree half the beans in a blender or food processor. I have used either; both work. 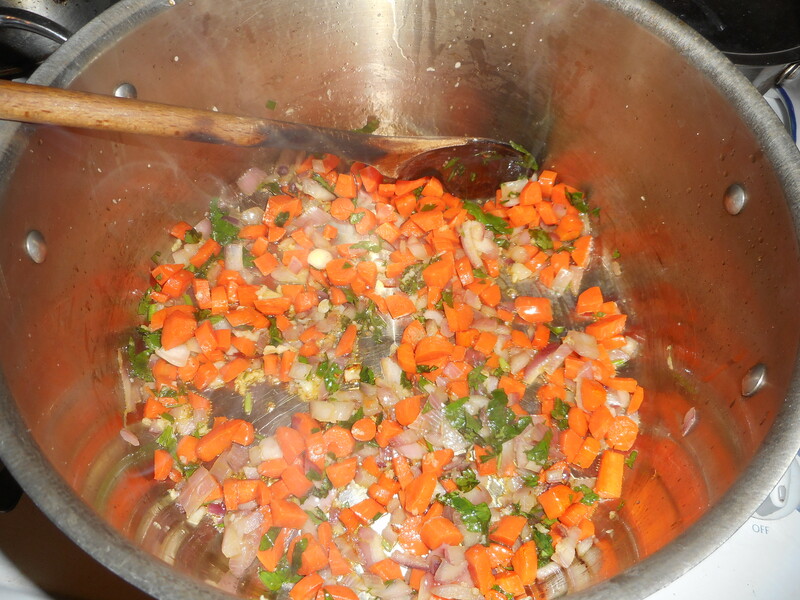 In a big, heavy bottomed soup pot heat the olive oil, add the onion and carrot, stir a minute, add the garlic and stir a minute. Add the parsley. Cook 5-6 minutes. 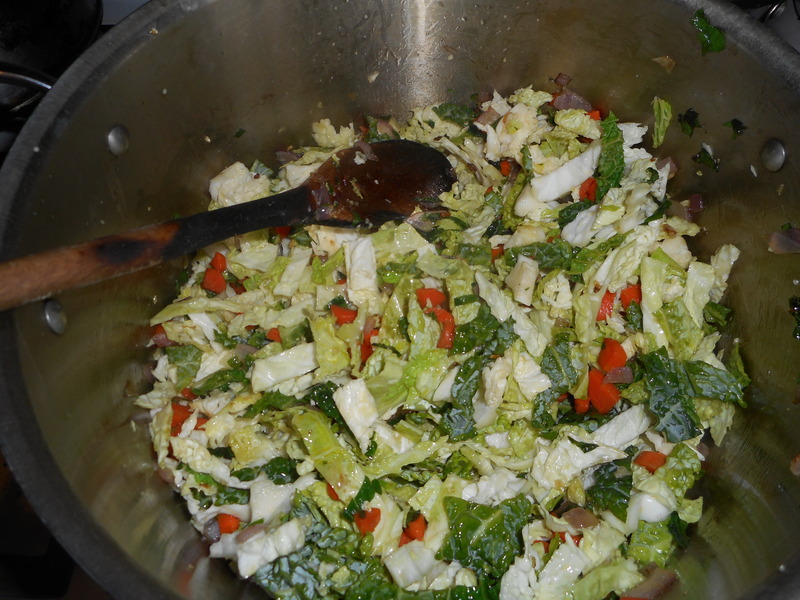 Add the cabbage which you have diced fine. Stir well for a minute or two, add 1 cup chicken broth. Cover and cook 10 minutes. 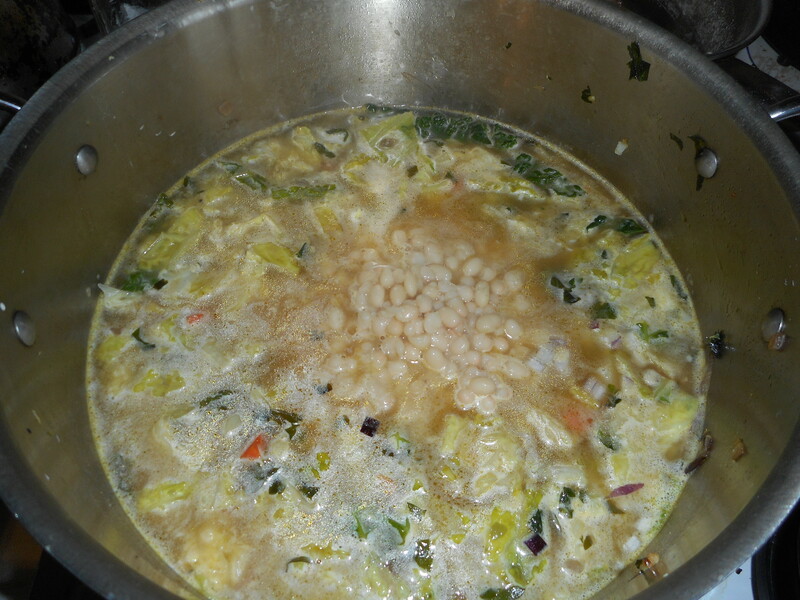 Add the rest of the broth, bring to a bubble; add the pureed beans and whole beans. Cook 10 minutes, stir 2-3 times as it cooks. Add the Arborio rice and cook 12-15 minutes; until tender but al dente. Stir it 3-4 times so the rice stays blended and doesn’t stick to the bottom and burn. Add salt and pepper to taste. Let rest 15 minutes before serving. Serve with a drizzle of EVOL on top. Great with a slice of hearty bread, gf of course!